Shipping a great new product, not necessarily based on a new technology is adequate for the growth of business. Steve Jobs made NeXT once he was forced to leave Apple behind. WorldWideWeb was invented on a NeXT computer. Still the business was not that good for NeXT. On the other hand Tim Berners-Lee refrained from releasing world-wide-web under GNU-GPL only on the basis that corporates might not get involved due to the leftist reputation of GNU and Richard Stallman. Thereafter came Linux, GNU’s much awaited kernel code from Finland. That struggled for desktop space although got server side business. Then came Andy Rubin. He simply made android by using Linux as its kernel and a great new product is born to get purchased by Google. That made its own space acquiring the highest growth rate ever seen in business. Apple got in trouble and Amelio started looking for a new operating system. Fortunately Apple bought NeXT shelling out much larger amount for less valued stocks but for what? Steve Jobs was hired again and what he did? He stopped Apple, looking for a new operating system. Instead he prepared Apple to ship the great new product iPod. iPod by Apple was greater than Walkman by Sony. Considering that the concept was not new as music listening on the go has already been a popular behaviour. iPod simply added great value to that popularity and became successful within no time establishing a great new user experience. Business became good around that. People do not buy a technology. People buy a product. Shipping a great new product, not necessarily based on a new technology is adequate for the growth of business. Set the homepage of your browser to http://system.sangkrit.net for making websites and start helping everyone around you as people’s personal outlet. Nikolai Chernyshevsky’s novel of this title published in 1863 telling the stories of the new people was favorite of Lenin, who wrote his pamphlet under the same title in 1902. What is to be done has been the eternal question follwing everyone everywhere but its answer becomes different at every stage of evolution. Still answering this everytime you combat coercion. Coercion establishes apartheid as all apartheid has been coercive by nature. Eliminating all that is the hacktivist task everywhere. Cooperation confirms the hacktivist politics diminishing all coercion by integrating humankind into humanity as a whole. The hacktivist movement has been an emerging class movement. This, by helping all the people to let everyone #OccupyWebspace, can make a mass movement around itself and become invincible forever. 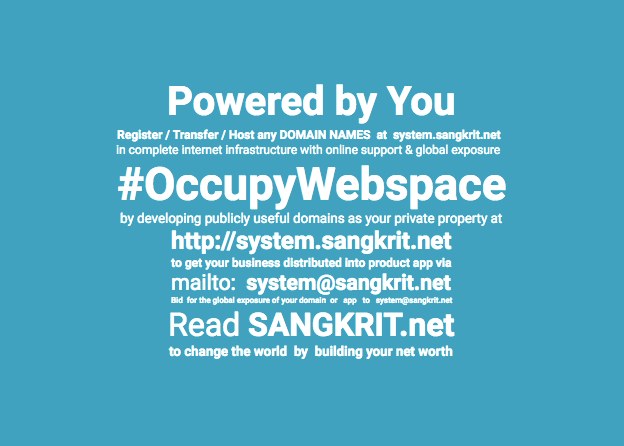 When people across all countries alike #OccupyWebspace by developing publicly useful domains at http://system.sangkrit.net to get globally distributed through android apps via system@sangkrit.net then SANGKRIT.net accumulates a global exposure that is sold to let a few people get globally glorious. Through this smartphone stage of internet age it is #OccupyWebspace for 99% and #GetGloballyGlorious for 1%. Set the homepage of your browser to http://system.sangkrit.net for making websites and start helping everyone around you as people’s personal outlet by charging reasonably. How To Export & Import Contacts Between Android Devices Or Gmail? While it is easiest way to use Gmail for syncing contacts and calendar on Android, but some devices has certain issues on this features and also it is certainly not required. In this lesson you will learn how to backup export and import all your contacts between your Android phones or email or both. You can also keep a contacts backup copy on your Google Drive for any time easy retrieval, when you need it.